Back in the UK for a couple of weeks before the start of the mad season, tarpon nearly ever morning and that very special permit spawn. 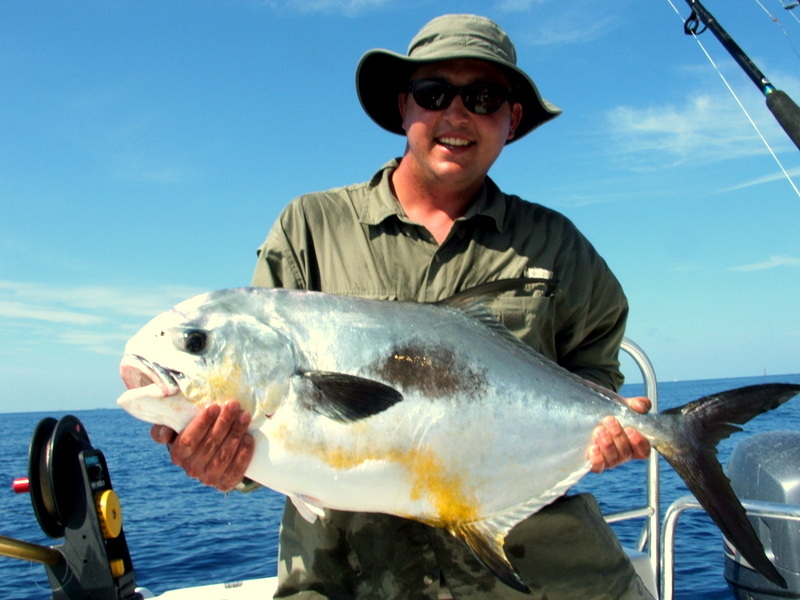 I am often asked in the over 10 years of doing fishing holidays in the Florida Keys what are my own special fish, the near 50 lb permit we had many years ago is one of the stand out fish. 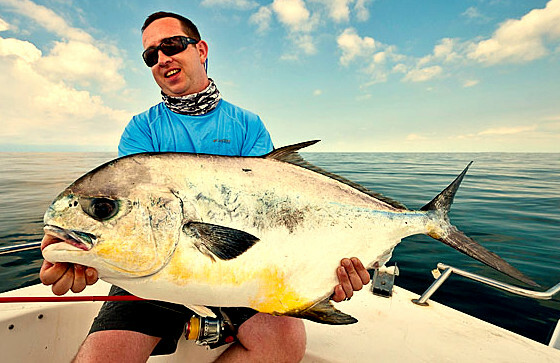 Sorry can’t even remember the guys name but remember the very special fish, we were having a ball very calm seas sight fish to very large permit which were swimming over the spawning wrecks some 9 miles offshore. Then a shoal of very large fish swam by they were so big we were not even sure that they were permit but I said throw a crab whatever they are they might take it. When the crab hit the water one of the smaller fish turned and took the bait fish ON !! in 112 ft of water these fish just power dive then you have to work them back up and 9 times out of 10 they just go straight back down again fun, fun, fun. Well this time we won and after a nervous time with the net fish in the boat this one was near 50 lbs god knows how big the bigger ones were I am sure we all looked at record permit that day. 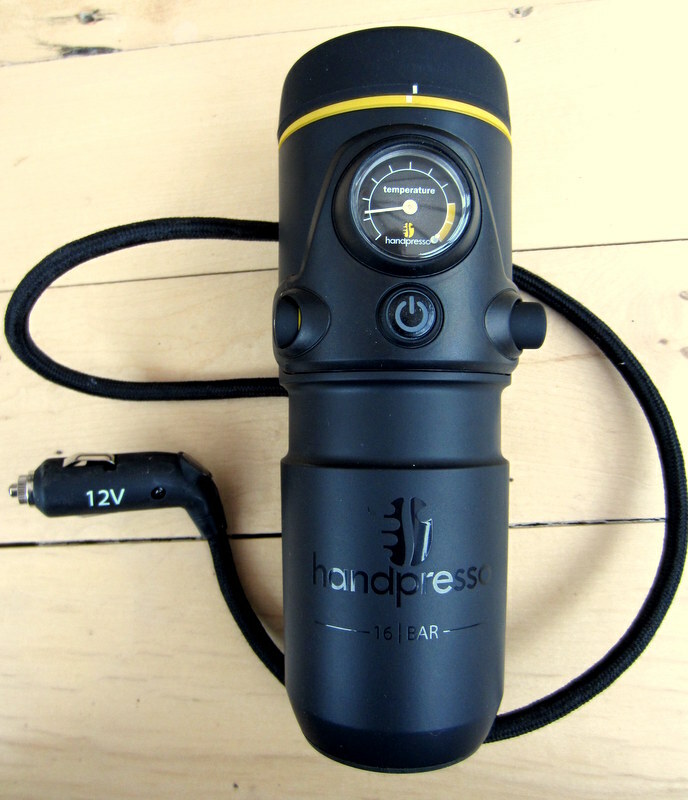 When I get back my boat will become a very special boat in the Florida Keys as after a long search I have found a 12 volt espresso coffee maker one of my personal passions. I gave up drink a few years ago 3 am starts and old age just don’t mix what people don’t seem to realize it for me it is not just their week but nearly every day for months and in all fairness I do feel a lot better. Coffee on the other hand is a very different matter over the years I have been on lots of mad diets with my wife which I was always happy to do but on one condition if it says no coffee you are on your own. The video with this blog is us feeding frigate birds just the best sett of eyes in the whole world and as one old guide said they have to do it for a living, find a circling frigate and you will find fish. 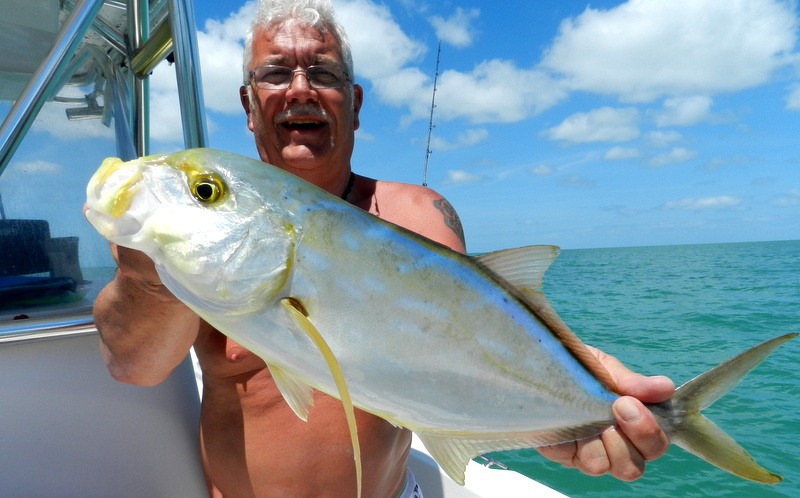 The longer I spend in the Florida Keys the more I seem to be accepted by the local guides I have always tried to give accurate information and the more I give the more I am given back. A few years ago one local young guide said ” Hey Rodney you like those big goliath grouper come over to my boat and I will give you some new numbers ” so off I went and came back with three new cool wrecks. 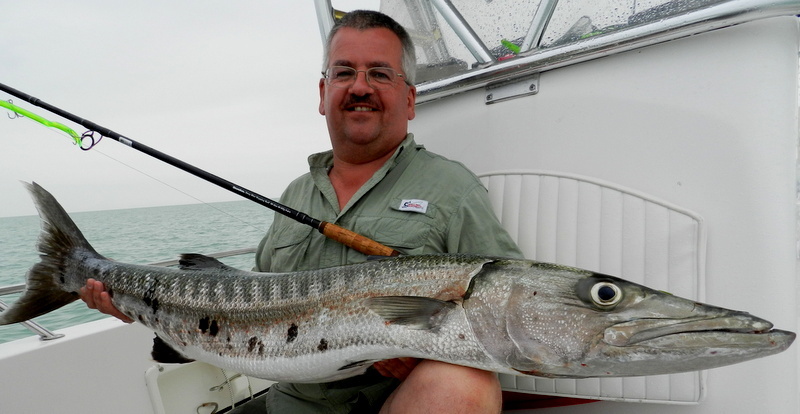 While the locals don’t seem to like goliath we all do so at the first opportunity off we went and all have goliath no surprise there but one always has barracuda. Why I am not sure but on nearly every trip as soon as we put the pick down over come the cuda, not just one or two but we have seen shoals of up to thirty fish they the come over and take up station right under the boat. While it looks like you should bag up they are very difficult to catch and can take a lot of effort they all like to chase lures but turn away at the last moment. We do however catch a few and I have to say thanks to a Jersey angler Simon Habin for finding their weak spot the old Cuda Tube and the greenest you can buy seems to do the Job. The one very cool thing they all do is jump high and often we have lost more than one when the do this but it always makes the anglers more determined to catch one. So why are there just on this one wreck and not others and why are they so hard to catch not sure, we have tried all lures and live baits but they just don’t want to play. 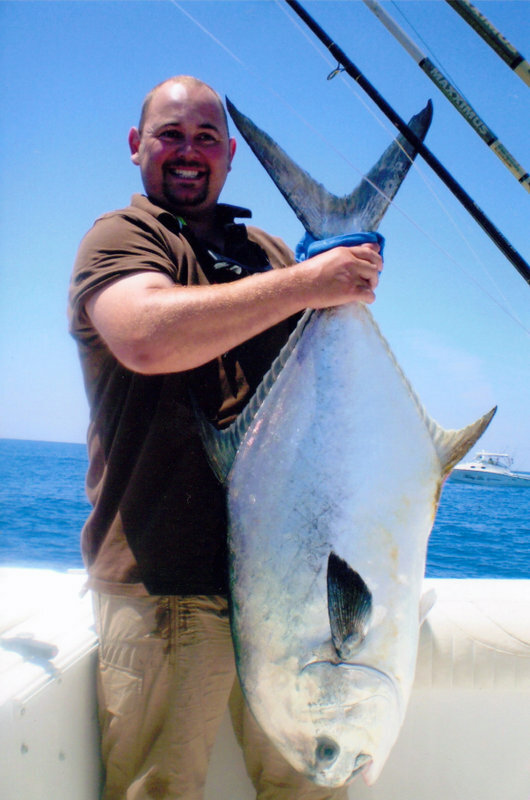 They once drove and angler to say next time I will bring a spear gun, not on my boat rods only, we have had them to over 30 lbs but have seen much bigger have a good look at the last video to see what the word frustration means ! 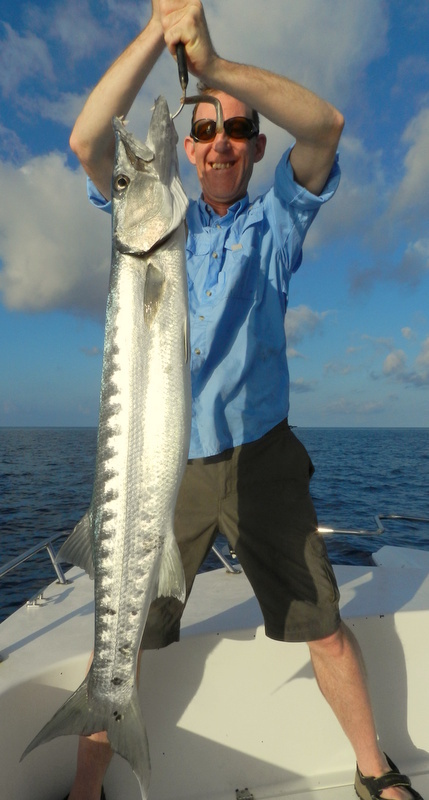 The number one question I am asked by anglers booking a fishing holiday in the Florida Keys is can we book a week when we will have light winds, I wish. After doing this for over 10 years the only advise I can give is there might be a hurricane during the hurricane season June to November and not out of the season. Take the last two parties just a few days apart, the Bromley boys had 6 days of the calmest seas I have even seen then the next week John’s party have ever day winds near 20 mph every day. Two things you need to take into account yes on calm days I now have over 300 marks to take you to but after a few days the water gets very stale and you need waves to oxygen into the water, and no matter how strong or direction of the wind we will go out and find shelter and we will catch fish. 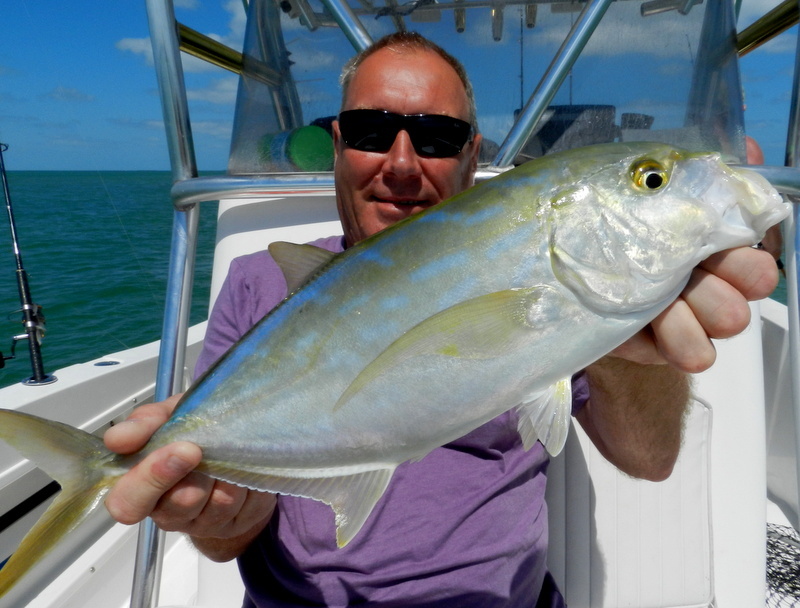 On one windy day last week we found fantastic yellow jack fish just feet from the old seven mile bridge, very hard fighting fish on light tackle and one of the the best fish you will ever eat. 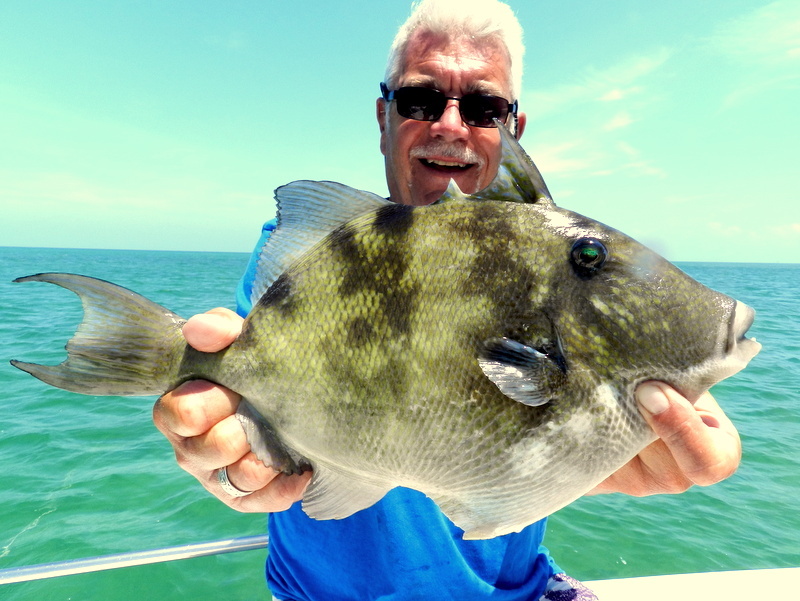 On the same mark we had one of the biggest trigger fish I have ever seen or had to the boat , one lucky fish as they eat as well but we had more than enough for dinner. 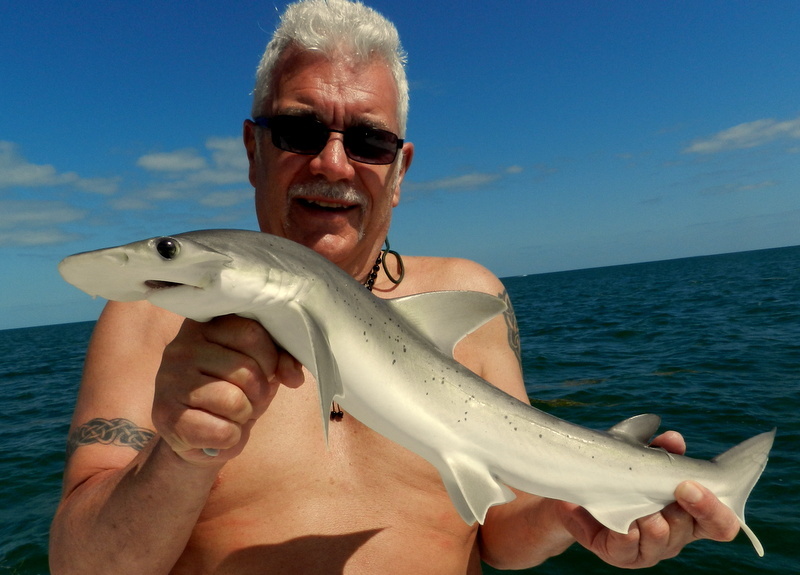 An other fish that brings nothing but smiles on windy days is our sporty shark these are blacknose and sharpnose shark and yes a 40 lb is a good fish but they sure pull your string. Also as you can see on the video it is not uncommon to have a better shark turn up and these on light tackle can be a hand full but fun and sort out the men from the boys. 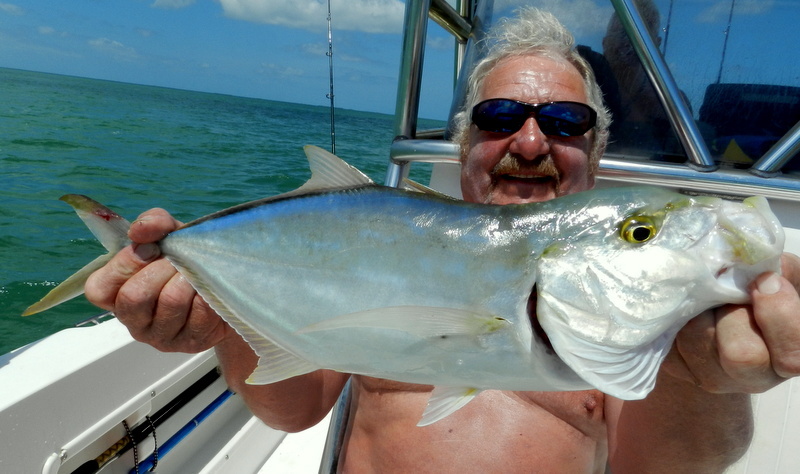 So have no fears on the weather in the Florida Keys we go out ever day and catch fish every day. 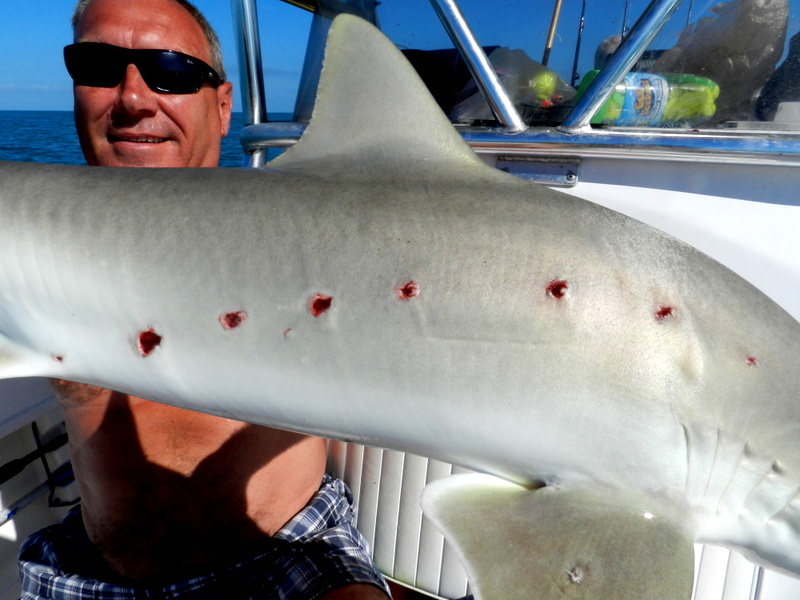 love them or loath them shark make up a major part of the Florida Keys fishery. 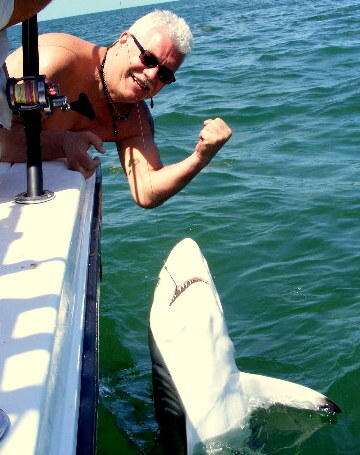 I am very lucky that most people on a fishing holiday in the Florida Keys are more than happy to link up and do battle. personally I love them most of the time but during tarpon season and the permit spawn even I can get ticked off with the men in grey suits as they say. Nothing gives you that sinking feeling after say nearly an hour of a perfect tarpon fight to see that pointy fin coming up behind your fish knowing it is only going to end one way. However most anglers always say after the foam, scales and blood disappear say ” that was awesome ” and you have to admire them letting the anglers do all the hard work. 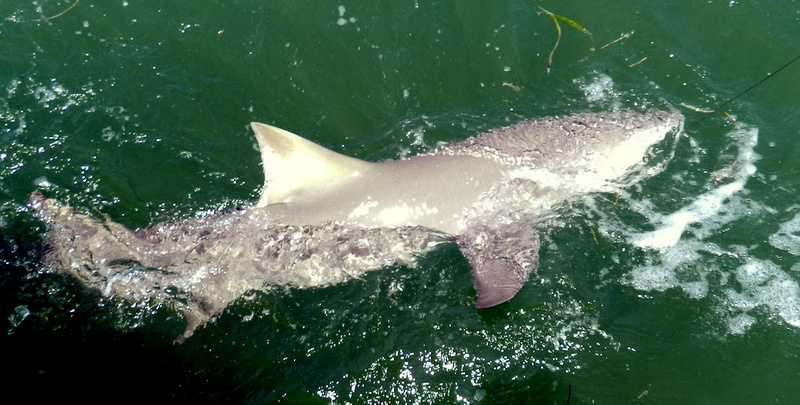 So far we have had 12 species of shark to the boat from the small sharpnose shark f a few pounds which unfortunately have become our best goliath grouper bait, to the over 1000 lb hammerheads with the over 2 hrs of pain that sticking one brings. 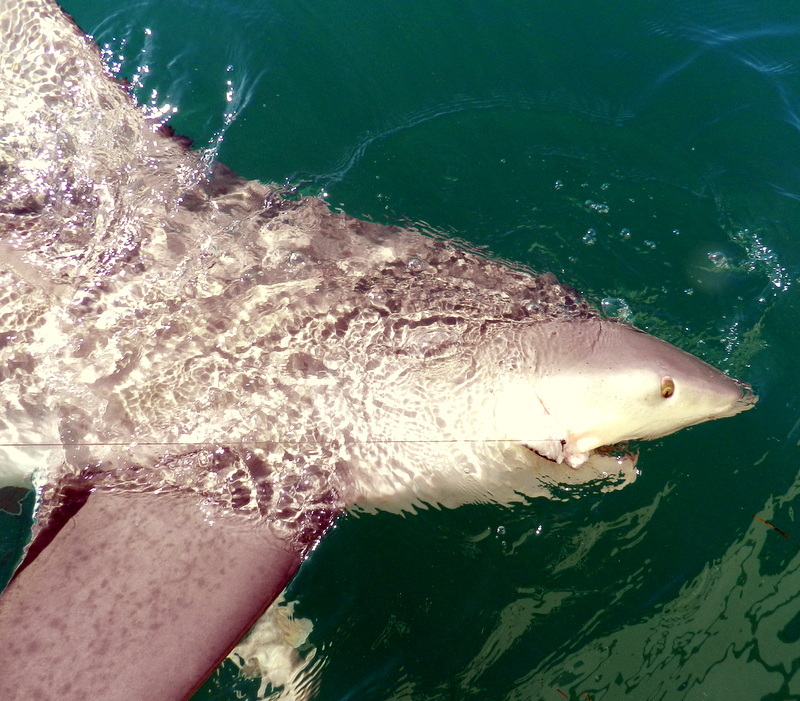 Last week however shark came to my rescue more than once the weather gods were giving us a hard time but after doing this for over 15 years I know many sharking marks that are not effected by wind. One day we ended up on one near the Everglades and on the north side of a large flat giving perfect shelter from the over 20 mph southerly winds. 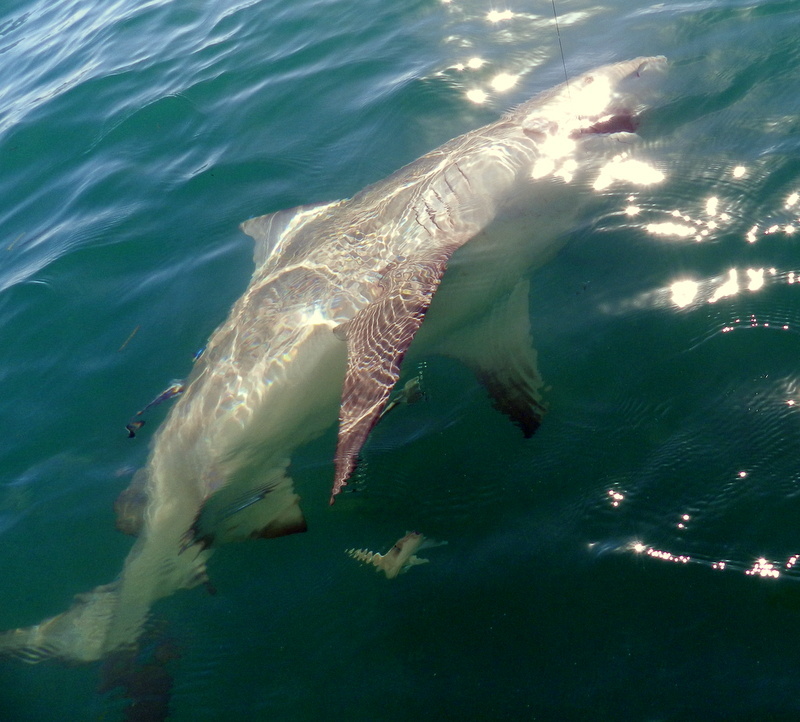 Normal practice is to sett a big bait way out down the tide share the runs and have fun with the sporty shark close in it was John’s turn when after over 300 yds on the first run we had to throw the pick and follow. 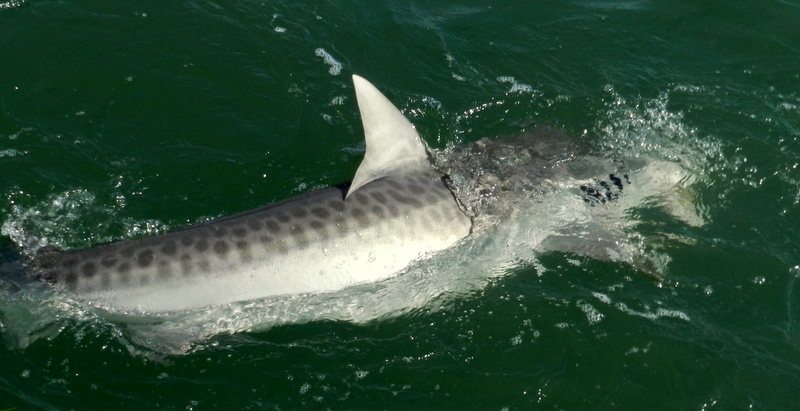 After nearly half an hour first sight and I saw the very distinctive tail of a tiger shark high fives and whoops all round a first for this crew soon John had it by the boat and what a well-marked fish and that first run will be in John’s memory for a long time. Next day same wind so we found ourselves on the same mark and yet again it was John’s turn when a lemon about 200 lb saved the day, and John is now known as shark boy. After what seems like an age the winds died down an I have been able to get John and the boys on the wrecks in Florida Bay. First day we had John’s friend along for the day and my job was to get a fish bigger than him normally not a problem but the grouper had different ideas. First one back was about 80 lbs a nice starter fish just to show the newbie what it was all about so down goes a big bait and the first of three unstoppable fish. The last one had a shark bait about 15 lbs and the float just buried no stopping this one, these fish go to near 1000 lb and in all fairness there is only going to be one winner, we have had them to about 500 lb which I think is about out limit. 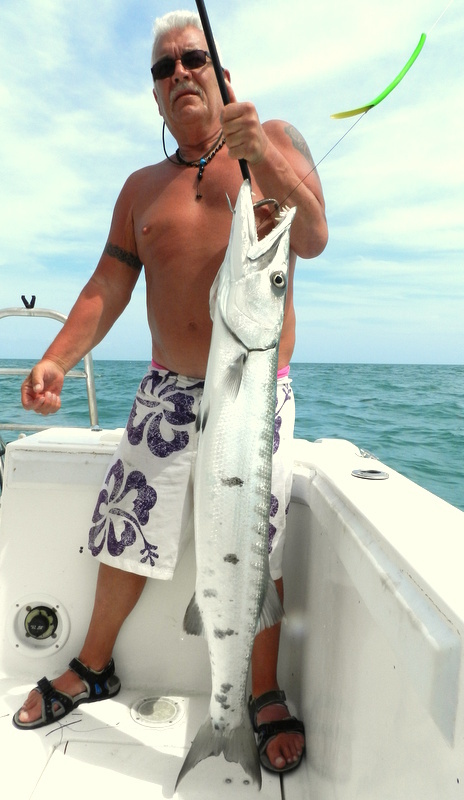 One very good fish was a barracuda way over 25 lbs for Ian there are so many cuda here but not easy to catch but on light spinning rods serious fun. 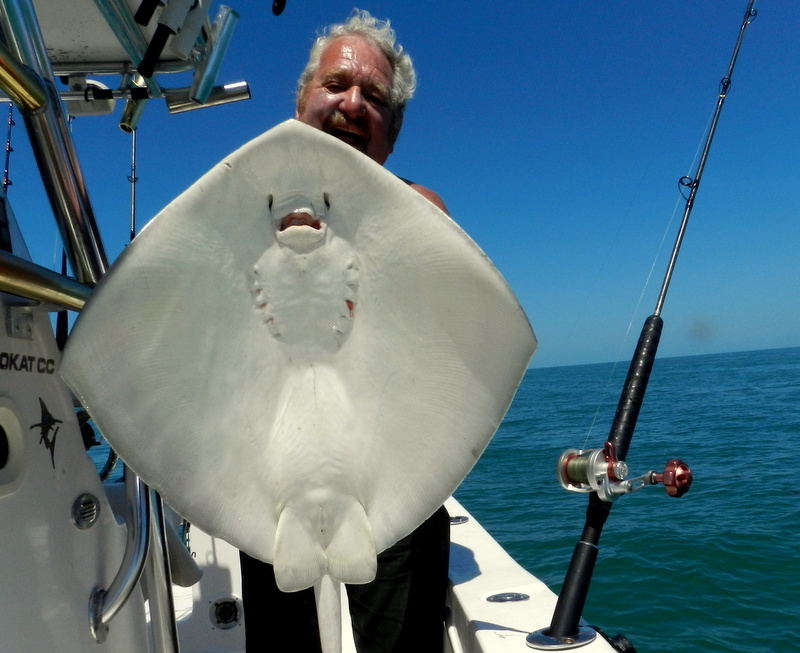 Yesterday the guys said can we go back for round to and as always with my fishing holidays in the Florida Keys the anglers call the shots so back we went, much calmer seas but a long slack water and as they say no run no fun but then the fishing picked up and Dereck had a nice stingray. 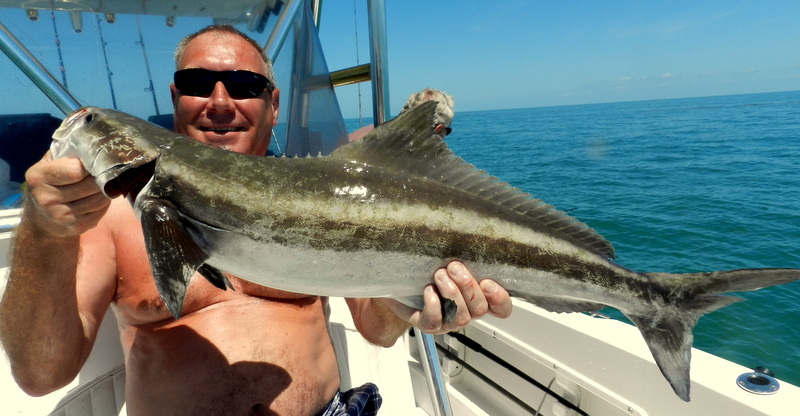 As the tide started to run the cobia came on the feed and John had a nice one also some of the biggest blue runners I have ever seen slamming the 2o lb jigging rods hard over. 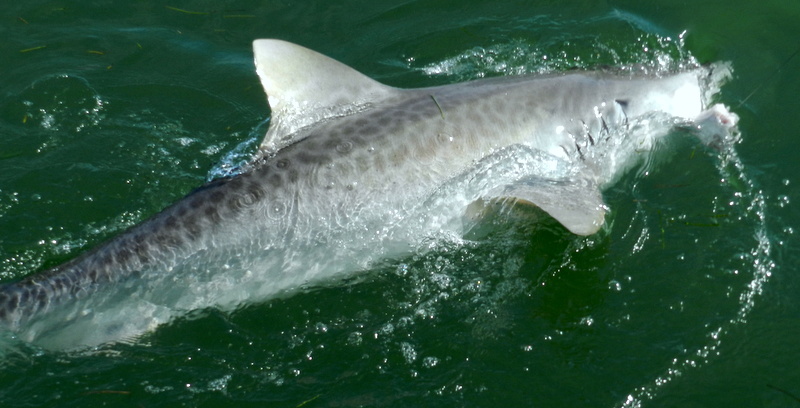 John also had the scary moment of the trip his 20 lb black nose shark was nailed on the way in, I think by a very big tiger the have been seen here well over 1000 lbs just look at what we call the teeth radius mark. Fish of the day and week so far has to be the bull shark well over 400 lbs that Ian had on the 40 lb ledger rod soft hands a very good angling skills had this to the boat in under 30 mins. Sorry I got a bit excited on the video but what you can’t see is the well over 20 cobia that were with this shark and some were about 50 lbs. Comments Off on Wrecking at last ! Well what a difference a week can be from the glass of last week to strong winds a yet an other cold front with a 4 degree drop in water temps. We are still catching fish but the trouble of have guys who have been many times they know where they would like to go and if the weather gods say no there is not a lot I can do, in fact we have had 100 lb fish ever day which is still very good. As you know here at Fish the dream we love our shark all sorts and all sizes as young Ian showed the other day on ultra light gear while trout fishing he had a little bonnet head shark so what was going to be a massive trout turned out to be a shark as theses little fellows pull way above their weight. Then later on is was his turn on the big rods and the fish was one of the most acrobatic I have seen for a long time full-out of the water barrel rolls, where is the Go Pro when you need it. I would put this fish way over 150 lb but to pregnant to bring aboard for the money shot I don’t want to harm my future spinners. 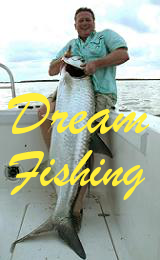 Talking about videos at the end of this blog you will see a short sad video of our first tarpon of the season yesterday to get some shelter we went to Bahia Honda where as you can see on the webcam link on my home page there have been tarpon for some time. With crabs and new rods and reels for 2014, at first they were hard to find then down about mid bridge the sounder was full of fish so pick down and with a very strong tide the wait was on. First fish was to Ian but this was a seasoned fish and took a hard left right through the concrete piles despite some serious grief from Ian this was only going to end one way, o for one as they say. Next fish was to Derek and this was a bit better out to the bay but I had to use the boat to unwind it from one of the main power poles then into the bay with a very happy crew. 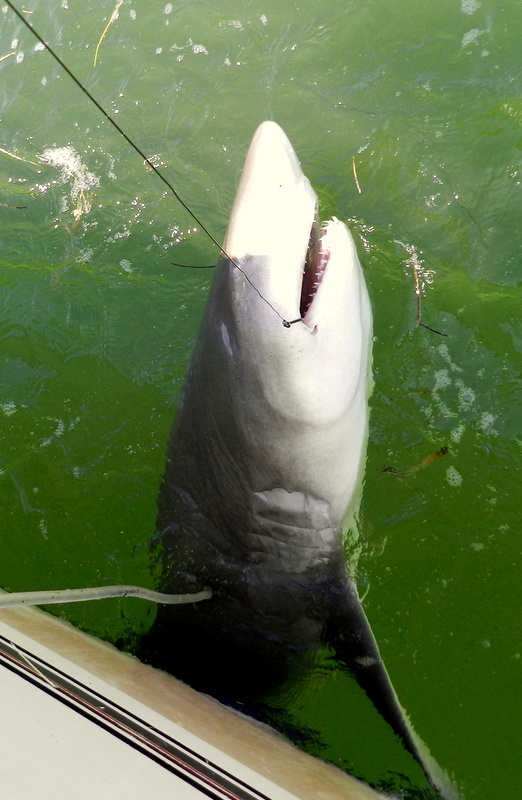 But as often happens here the line went very solid and started to go back to the bridge yes mister bull shark wanted his lunch, after doing all the hard work this is soul-destroying but welcome to the world of tarpon fishing.